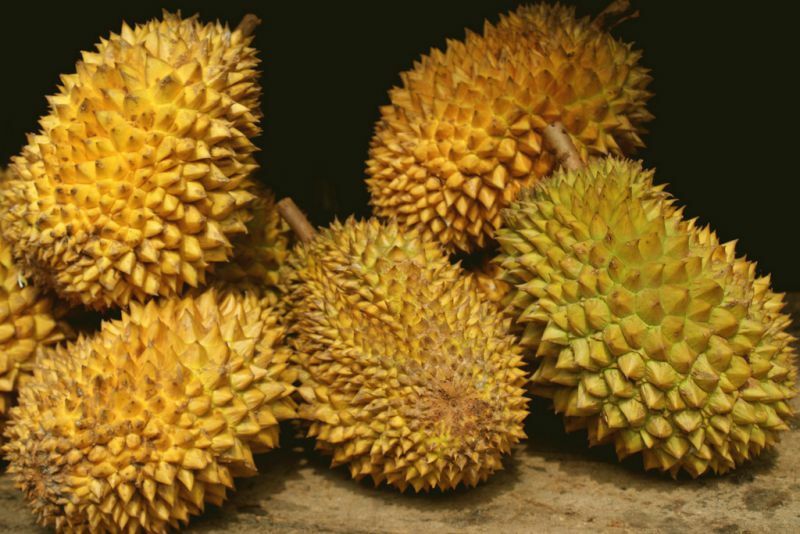 Bizarre fruits that taste like chicken (really! ), ice cream, scrambled eggs, and more. The last grape-related gimmicky fruit that really made a splash was the Grapple, an apple that had been soaked in grape juice. Not really that exciting, when you put it that way. But this year, the most intriguing new grape variety is the Cotton Candy Grape, bred in California. No genetic engineering, no sneaky added flavors: The breeders simply crossbred until they came up with the flavor they wanted, a peculiarly light, incredibly sweet flavor more than a little reminiscent of spun cotton candy. Sometimes fruits have a totally different flavor when unripe versus when ripe. Think of the mango or papaya, which, when unripe and green, are crunchy, vegetal, and usually used as a vegetable. The jackfruit, though, takes that a step further. 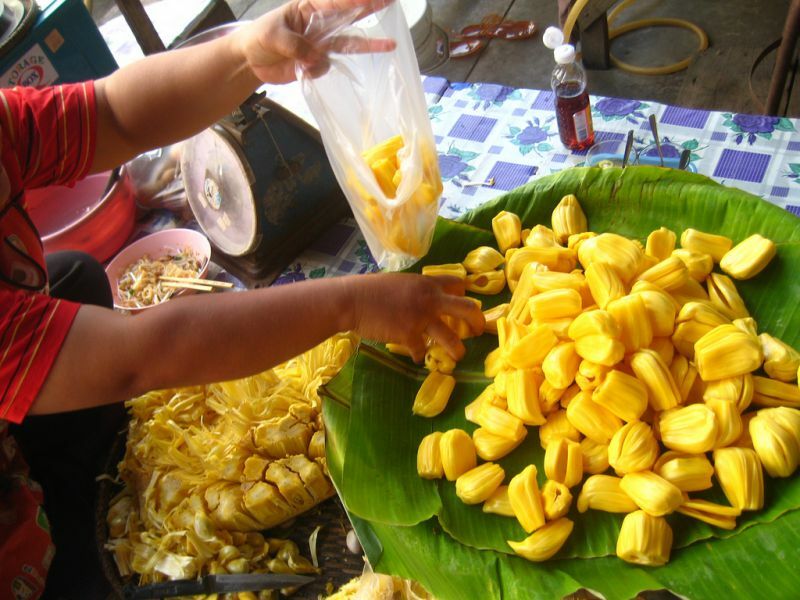 A gigantic, spiky fruit – like, up to 80 pounds – the jackfruit is native to South and Southeast Asia. When unripe, the flesh, which comes out in kind of pod shapes, has a taste and texture weirdly similar to chicken breast. When ripe, it’s something else entirely: a crazy-sweet tropical flavor that’s been variously described as somewhere near pineapple and somewhere near bubblegum. From the outside, it looks more like a medieval weapon than anything that could be described as similar to bubblegum. Here in the US, we’re accustomed to one, two, or maybe three types of bananas. There’s the “regular banana,” which is technically of the Cavendish variety. There are baby bananas, too, which show up in markets sometimes, and I suppose you could toss plantains into the mix, too. Few Americans are familiar with the Blue Java banana, a variety that is, yes, a pale and lovely blue, which is weird enough already. 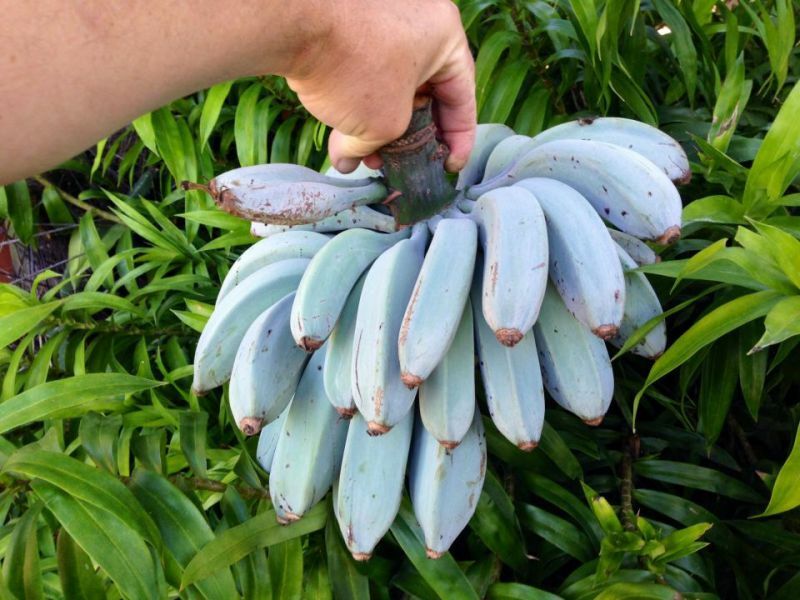 But it gets weirder: The Blue Java is also sometimes known as an “ice cream banana,” because it tastes bizarrely similar to vanilla ice cream. Strawberries are pale when unripe, a fact that’s becoming more relevant as chefs have begun playing with green, unripe strawberries in savory dishes and pickles. 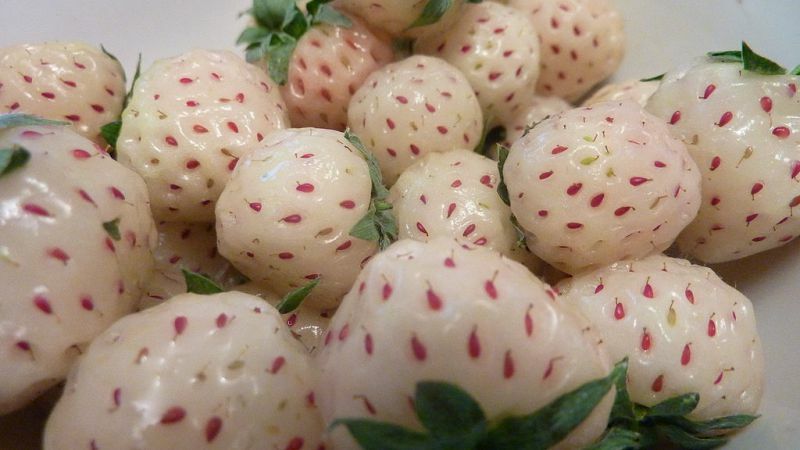 But pineberries are even paler than that: They’re small, nearly white berries that debuted in the New York area in 2012. But they don’t taste like regular strawberries: In Germany, they’re known by the name “pineapple-strawberry,” testifying to their distinctly pineapple-like flavor. 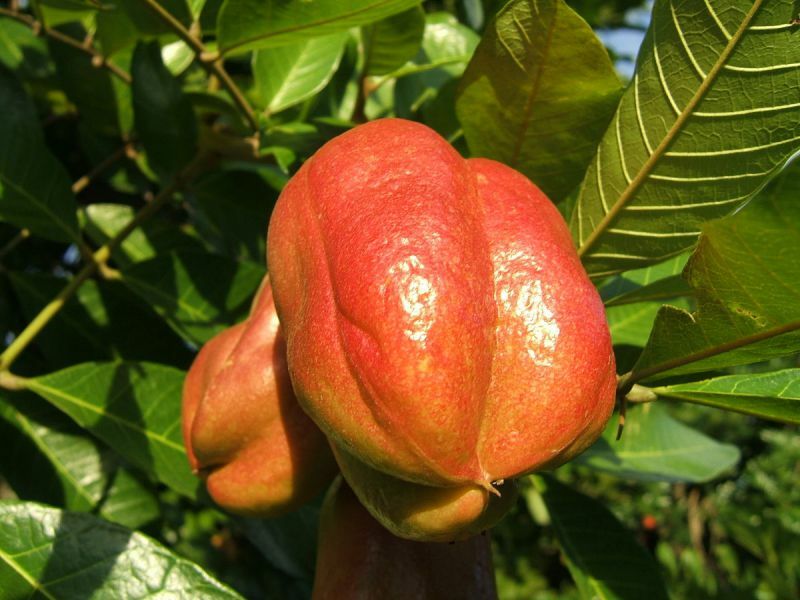 The ackee is a fruit in the lychee family, native to West Africa. It spread with the slave trade and found itself best loved in Jamaica, where it’s become an integral part of the national dish, ackee and saltfish. The fruit is shaped sort of like a brain, and pale white on the inside while bright, festive red on the outside. However, it doesn’t taste like a tropical fruit at all – its flavor and texture are most similar, flying in the face of all reason, to scrambled eggs. “Ackee 001” by Jerome Walker – Own work. Licensed under CC BY-SA 3.0 via Commons. 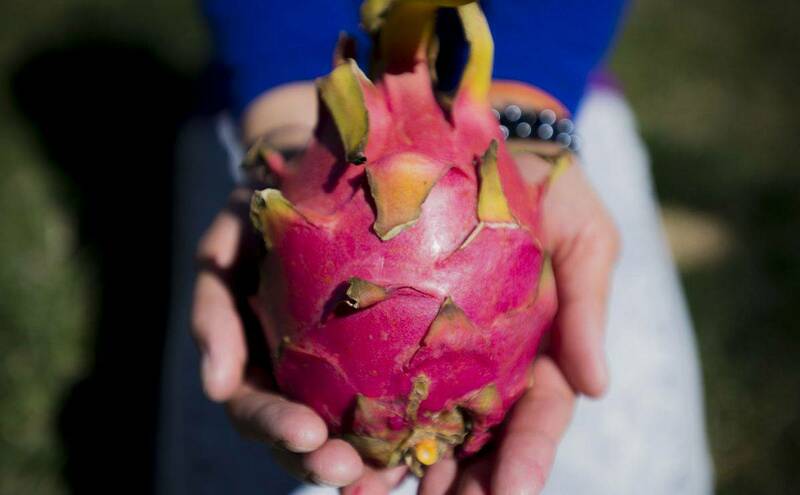 The dragonfruit, pictured at the top of this post, is perhaps the world’s coolest-looking fruit: a supernatural orange-pink, oblong with petal-like protrusions coming out from all sides. And it’s called the dragonfruit! What a cool name! Open it up, and you might be even more intrigued: The most common varieties are either pure white or a blood red, both with many tiny black seeds. And all of that crashes to the ground as soon as you taste it, because the best-looking fruit in the world is also one of the most bland. Dragonfruit tastes like an unholy offspring of a kiwi and a glass of sugar-water. Zero acidity, very little flavor, just a slight sweetness. It stinks. I’m an avid gardener and always looking for something different to plant. What is the fruit called that looks like a purple grape or even a black Olive? The fruit has the tendency to dry out your mouth?